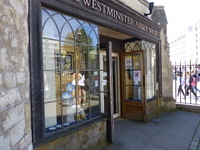 The main Abbey Shop is a separate building, located at the west end of the Abbey, near the Great West Door. 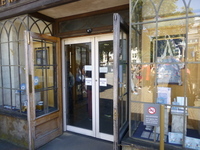 The shop is outside the area where visitors require tickets. 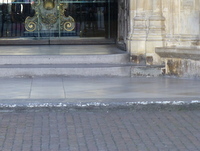 For the Westminster Abbey DisabledGo access guide please click here (new tab). 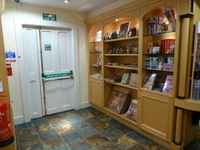 For the The Cloisters and Cellarium Shop DisabledGo access guide please click here (new tab). 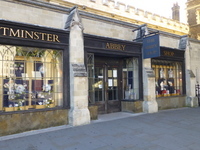 There is a second, smaller shop within the Abbey Cloister. Please see the guide to the Cloister for details. 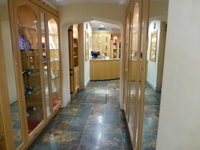 The main shop opening times are extended in July and August when it closes at 18:30 on Mondays, Tuesdays and Thursdays. The Abbey is located in central London, close to the Houses of Parliament and Big Ben. Access is from Broad Sanctuary/ Victoria Street. 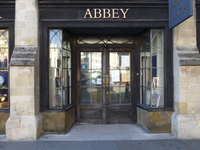 There is no parking at the Abbey or in nearby streets. It is possible for private cars and taxis to drive into The Sanctuary, at the west end of the Abbey, to drop off passengers. There are generally taxis available in this location. 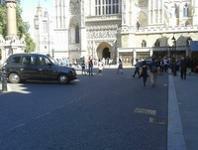 Westminster Abbey is served by TFL services 11, 24, 88, 148 and 211 from all over London. 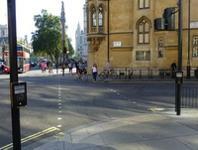 The nearest bus stops are in Parliament Square, Victoria Street and Great Smith Street. Please see the TFL website to plan a bus journey to the Abbey. Every London bus route is wheelchair accessible, with automatic ramps and designated wheelchair spaces. The nearest Railway Station is Charing Cross, Waterloo or Victoria. Staff are available to assist with portable ramps from train to platform at these stations. There is step-free access from platform to street at each station. 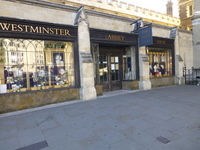 There are bus services and taxi ranks at each station to complete the journey to the Abbey. Westminster is on the Jubilee Line and District and Circle Lines. 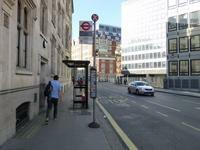 There is step-free access from tube to street at Westminster Underground station from the Jubilee Line. 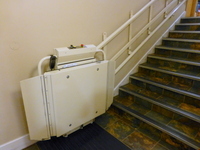 Portable access ramps are required from tube to platform on the District and Circle Line trains. Please see the link to the TFL Journey Planner for access details of connecting routes and stations. 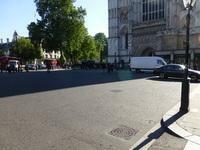 It is about 0.2 miles (5 minute walk) from Westminster Undergound to the Great North Door visitor entrance. There are pedestrian crossings at all road crossings on the route. TFL Journey Planner to Westminster Abbey. TFL accessibility guides, including audio guides and large print guides to download or order. The audio guide to the Abbey, in a choice of languages, is available to download to a smartphone or tablet in advance of a visit. The large print guide to the touch tour of the Abbey is available to download and study in advance of a visit. You are on Approach (Great West Door Forecourt). Skip to the next section. The surface of the approach is cobbled. There is step free access on the approach. This approach is used by visitors leaving the Abbey by the Great West Door. 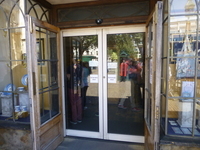 You are on Outside Access (Great West Door Forecourt). Skip to the next section. This information is for the entrance located facing the forecourt of the Great West Doors. The width of the door opening is 146cm. You are on Approach (Main Entrance - The Sanctuary). Skip to the next section. 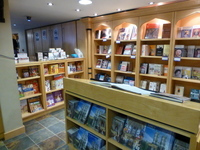 You are on Outside Access (Main Entrance - The Sanctuary). Skip to the next section. This information is for the entrance located facing The Sanctuary, off Broad Sanctuary. The width of the door opening is 170cm. There is not a/are not door(s) in corridors/walkways which have to be opened manually. 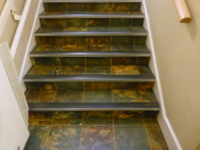 The type of flooring in corridors/walkways is tiles. This venue does not play background music/sound. You are on Counter (Till Point). Skip to the next section. 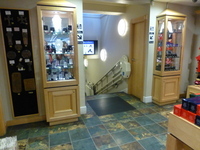 The counter is located on the ground floor, straight ahead from either entrance. The counter is approximately 5m (5yd 1ft) from the main entrance. There is a clear unobstructed route to the counter. There are not windows, TVs, glazed screens or mirrors behind the counter which could adversely affect the ability of someone to lip read. The counter is not placed in front of a background which is patterned. The lighting levels at the counter are good. The height of the counter is high (110cm+). The lowered section of the counter is not at the recommended height of 76cm. 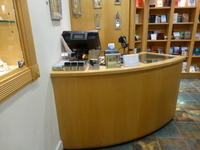 There is sufficient space to write or sign documents on the lowered section of the counter. There is not a hearing assistance system at the counter. 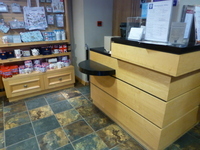 There is a lowered section of the counter (92cm) to the left of the main counter. There is a 74cm high writing shelf in front of the lowered counter. There is also a till on the lower ground floor, 90cm high. You are on Other Floors (Lower Sales Floor). Skip to the next section. The stairs are clearly visible from the entrance. 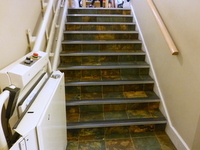 The floors which are accessible by stairs are LG-G.
You are on Lift (Lower Sales Floor). Skip to the next section. The lift is located on the stairs leading to the lower ground floor. The lift is clearly visible from the entrance. A member of staff needs to be notified for use of the lift. 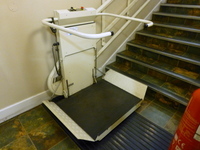 A member of staff is is required to operate the lift. The dimensions of the lift are 73cm x 86cm (2ft 5in x 2ft 10in). The lighting levels in the lift are good. The nearest accessible toilet(s) is/are located off the Abbey South Cloister, using the Dean's Yard entrance. 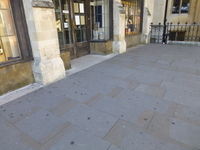 The nearest standard toilet(s) is/are located off the Abbey South Cloister, using the Dean's Yard entrance.